Beth Pent’s career path is hard to classify! Surveys have shown that “Classification Talks” are one of our members’ favorite program topics. The concept of a “Classification Talk” apparently comes from the days when Rotary clubs tried to have a cross-section of careers represented, and members were targeted and “classified” by their type of employment. 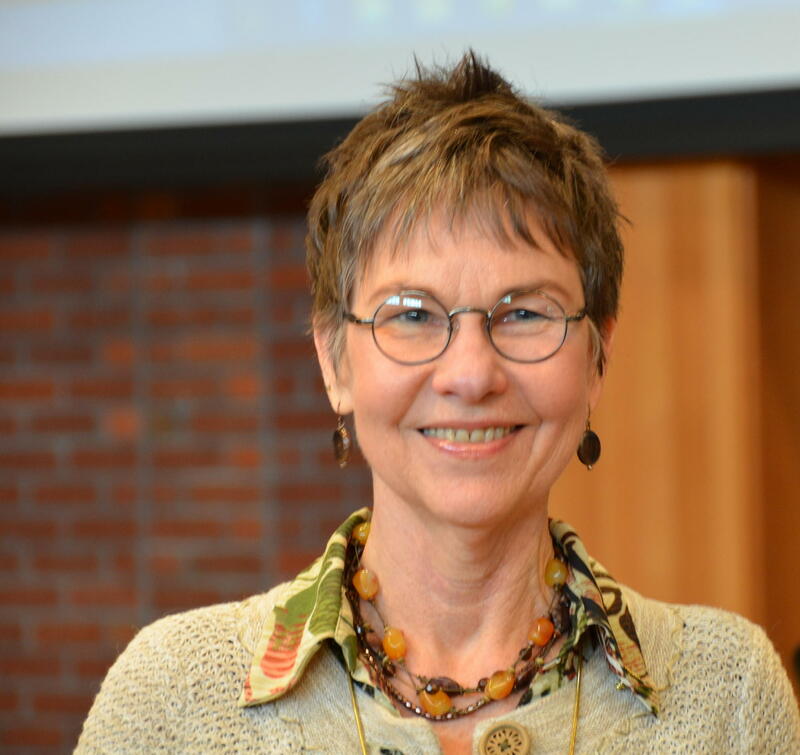 New member Beth Pent gave that concept a real challenge with her fascinating talk last week. Beth was born in Philadelphia. Her father was a missionary and a pastor. 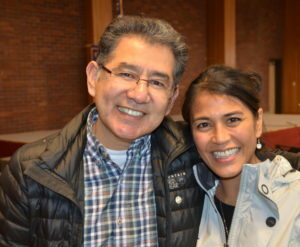 When she was very young, he took the family to Iquitos, Peru, to run a church there. When a younger sister died at 6 months of age, her dad became bitter and “went native” (left the church and the family). Her mom then moved them to Cheyenne, Wyoming. “I got out of Cheyenne as soon as I could,” she smiled. She joined a traveling sales crew, then joined the military. “I told them I wouldn’t sign up unless I could go to Germany,” she said. She got to go, but turned out to be “Private Benjamin Extraordinaire.” She ended up marrying and moving back to Cheyenne. After that, she moved to Colorado Springs and worked for an organization that prepared master plans for the National Guard. “I thought, ‘I’m going to find something I can do working for myself,” she said. So she got a sales job and her territory was the Pacific Northwest. “I sold stuff to gift stores. I sold crap. People buy crap,” she laughed. One of the gift stores was in Leavenworth, and that led her to the small town of Peshastin. She fell in love with the area and bought a small house. “I figured I could work from home there as well as anywhere else,” she said. About that time, a colleague noticed she was good at sales and offered her a job at a funeral home. She turned it down, but then found out that, “I am so bad at retail sales I lost customers. So I called the funeral home again and they had some jobs in Oregon.” And here I am! She gave us a helpful list of items to consider and said if you would like to know more, you can call her. Have you talked to a professional? You should. Auction Chair Denise Bacon updated us on event plans. April 28. April 28. April 28. Got it? Be sure to put it on your calendar. That is the date of the 2018 auction at The Allison Hotel. The theme this year will be EAT DRINK PLAY YAMHILL COUNTY. Club members brainstormed ideas last week to try to meet a goal of raising at least $70,000 this year. According to Denise, some important ways to do that are to buy a sponsorship, which starts at $250, or a Golden Ticket for $100. Auction proceeds allow our club to offer scholarships and grants that benefit local kids and organizations like Helping Hands, The Mountain View Middle School Resource Room, the annual Holiday Tree Lighting Ceremony and so much more. There will be an auction committee meeting after lunch on the 24th. Nicky Colo’n, president and events representative with the nonprofit “PNW for Puerto Rico Relief,” visited with us again. He said they are having a crab feed fundraising event on March 9 from 5:30 to 8:30pm at the Beaverton Elks. Tickets are $35 and must be purchased in advance. For more info, call 503-757-3391. Alex Davis has moved to the area from Grants Pass, where he went through RYLA. 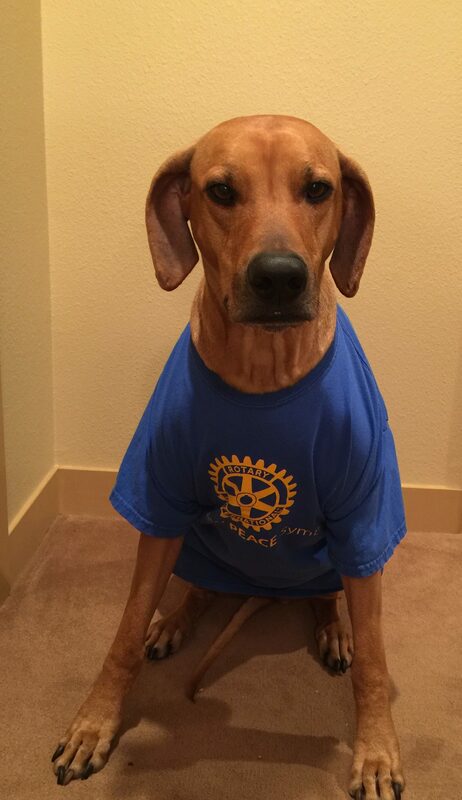 He wants to stay active with Rotary, so came to check us out. Also checking us out was Patrick Bancke, a real estate broker specializing in Newberg, Bend and Lake Oswego. 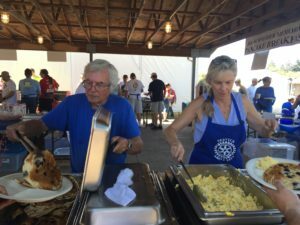 He said his family has been in Rotary “forever,” and now that his last kid is in college, he has time to give back. A full house at the Cultural Center watches the Edwards Elementary School Folkloric dance troupe perform. Our club is a supporter of Newberg’s annual Dr. Martin Luther King, Jr. holiday event at the Cultural Center. Approx. 350 attended this year’s gathering, which featured Ines Pena, the first ever Latina to be the keynote speaker. Much of the program, which also included a variety of performances by local talent, was translated into Spanish. Thanks to the leadership of Club President Todd Engle, a new option for a career path in the health care industry is available in Newberg. In his role as executive director at Friendsview, Todd saw a need in the community for Certified Nursing Assistant (CNA) training. 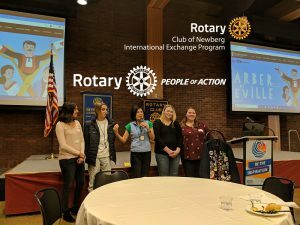 He gathered together local interests, such as Providence, the Newberg School District, Willamette Valley Medical Center, Rotary and Chemeketa Community College to develop a certified, two-month program that meets state requirements. The class will be offered at Newberg High School for the second time in February. For more information, please contact Todd. Dave Parker reported that the Scholarship Committee is gearing up to award close to $50,000 to local high school students this year. Informational materials will be sent to schools the second week of Feb. Readers will be needed to review the applications in early May, so if you have an interest in volunteering, please contact Dave. Before she left for vacation in Mexico, Marge O’Connell told Paula Radich that a total of 83 tee and polo shirts have been ordered by both clubs. They are expected to arrive in mid-Feb. According to Paula, Marge will not let you have your shirt unless you pay first, so start saving! Kudos to Marge for her work coordinating all the orders. Corey Zielsdorf thanked the club for its support in providing tee shirts for the Newberg High School Robotics Club. This, and other tips, were provided by our speaker, Ashley Mumm, during the second part of the two-part series on “Effective Use of Social Media.” And, as her first presentation visual said, THE WORLD HAS CHANGED. Indeed it has. For example, who begins a presentation by introducing their dogs? Ashley did. We got to meet her “office crew”–her dogs, Sookie and Hercules. We were infotained! The main part of Ashley’s talk focused on two areas: Branding 101 and Marketing Today. According to Ashley, your brand is the promise you make to your customers (or that is made for you). It is the value you offer as seen by the customer. It is how your business is perceived, which will make or break your success. Your logo, website, your services and product are all part of your brand. In the Q&A after her presentation, Ashley addressed the issue of metrics. She suggested monitoring “cost to make” and “cost to distribute,” as well as revenues. On Facebook, monitor likes, exposures and shares. She also said you need both a Facebook page and a website. Ashley gave some tips for defining your audience. Create a “brand persona” by defining the characteristics of your audience. Translate those into demographics. Then give your audience a face. Maybe even use a photo to remind you of the typical audience member. Write your promotional materials towards that face. Don’t forget to check your email for the free marketing tips package Ashley so graciously is sharing with us. If you need some marketing help, you can reach her at Mumm-Marketing.com. Auggie Gonzales got some great surprise news from his friend, Vida Ice. 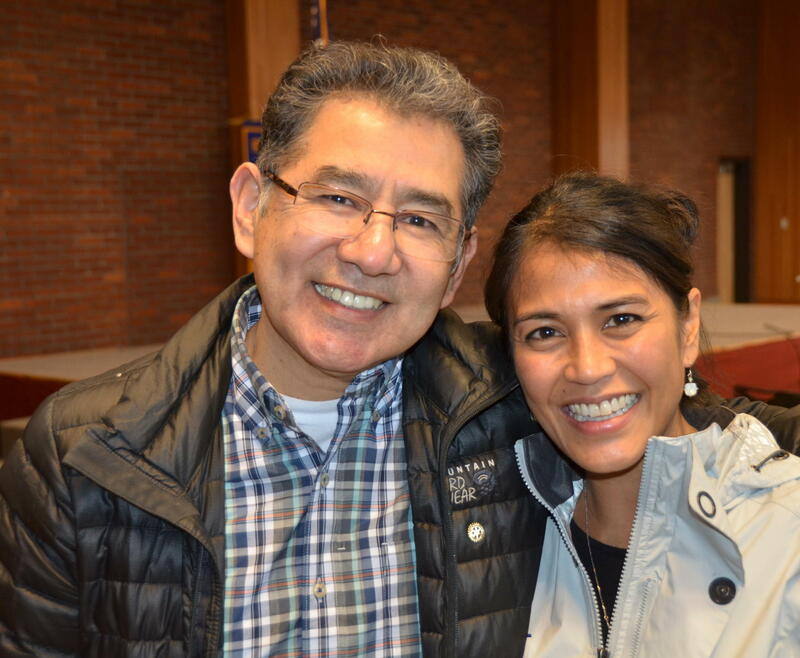 Vida Ice and her husband Darryl, who represent Arbonne International health-oriented products, attended our meeting to make a surprise announcement: that Auggie Gonzales has been named “2017 Volunteer of the Year” by the Chehalem Valley Chamber of Commerce. Area of inspiration or outstanding performance: Auggie Gonzales is an exemplary individual who is an outstanding citizen with a genuine interest in rising up the next generation of leaders and conscientious citizens. 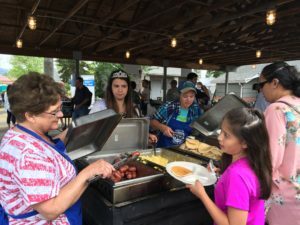 While he is involved in many non-profit endeavors to serve his community, his servant attitude carries over into his business practices as well. 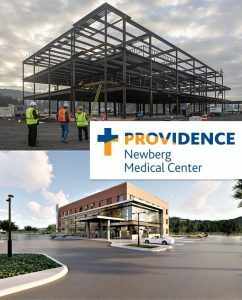 At the Newberg Urgent Care, he fills a need for quality, affordable healthcare, but he also provides a means for young individuals to volunteer, shadow the clinicians, and provide valuable mentorship to youth interested in healthcare careers. Mike Caruso, left, presented Grant Gerke with a Paul Harris award for being a “Plus 5,” which means Grant has given at least $6,000 to the Rotary Foundation. Wow. Congratulations and thank you, Grant! Mike also mentioned that of the 74 clubs in our District 5100, our club is #2 in number of Paul Harris members, with 13. He challenged us to go to #1! Our club’s first ever “Friend of Rotary,” Ann Dolan, joined us. Shaina Ferrar from Love Inc. and Nick Hoogendam both attended a week ago and joined us again last week. Visiting Rotarian from the Morning Club, Darcey McAllister, was a guest. Darryl and Vida Ice brought an exciting announcement. 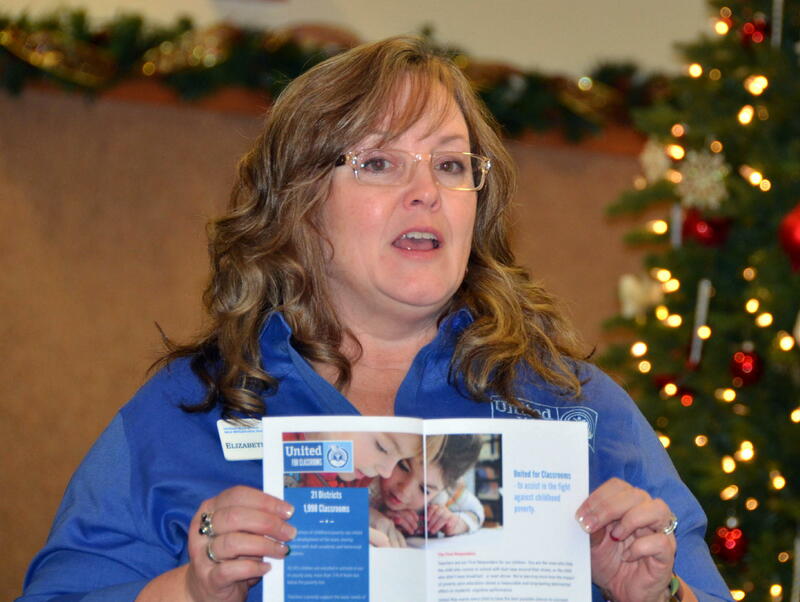 Denise Bacon announced the next Auction Committee meeting will be Jan. 24th, right after our lunch meeting. The agenda will be to review the information and ideas we come up with at this week’s meeting. 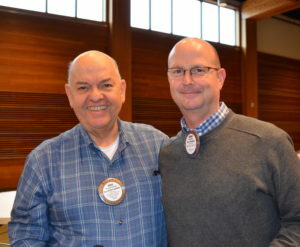 Jim McMaster mentioned Rotary International President Ian Riseley’s 2017-2018 challenge that every Rotarian plant a tree by Earth Day (April 22, 2018). We will have an opportunity for club members to meet the challenge with an upcoming service project: planting trees at the new Aquatic Center. More info coming soon…. Jim Hirte announced his 50th wedding anniversary. Congrats to Jim and his wife! 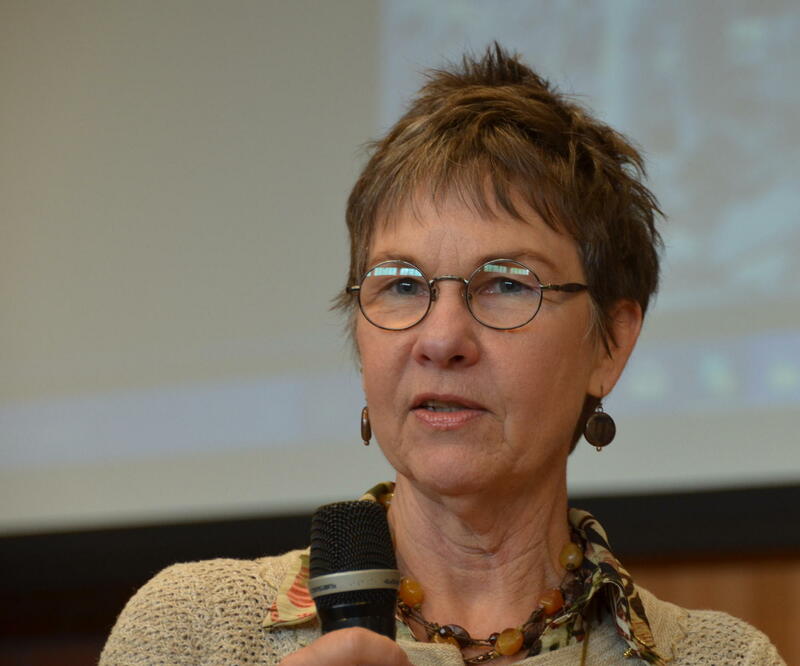 Beth Pent asked for help finding affordable housing for a new receptionist at Attrell’s. If you know of a place with rent of about $700/month, please contact Beth. Shannon Buckmaster introduces Brandon Porter. The first speaker in a two-part series of programs on social media, Brandon began by providing background on his career and how it led him to use Facebook especially. He has a B.S. in Psychology from George Fox. His first job was in sales at Acura of Beaverton. He became known there as a “client advocate,” and often took the client’s side, not the dealership’s, in negotiations. “Then real estate came in to the picture, where being a client advocate is good, ” he smiled. He is now a licensed realtor. “With some 9000 realtors in Oregon and so much competition, I had to find a way to stand out and do something different,” he explained. That “something different” was use of social media. “Today, the #1 consumer information source is video. Live video is especially important. People love watching you,” he said. Local Facebook show host Brandon Porter. Hold the phone sideways, not vertically, to fill the screen better. Studies show 60% of people will stop watching a video after two minutes, so keep it to that. He recommended taking the time to create posts worth engaging with, because you need people to respond quickly. As you engage in a genuine, meaningful way, your affinity goes up. You should also comment on a post in a way that solicits a response. There is a concept called “time decay,” which is how long it takes a post to disappear off of the newsfeed. He said many posts last only 70 to 90 seconds and disappear if not engaged. Brandon also gave an example of how you can brand yourself on Facebook by adding value rather than by directly soliciting business. “A friend in the insurance business captured on video an SUV pinballing down a hill in Tigard in the ice and snow. He posted it, then used the “whip effect,” which is taking momentum from the first post and transferring it to a second post. He formulated tips for what to do if you get in a car accident and posted those. He offered help instead of soliciting” and generated business. 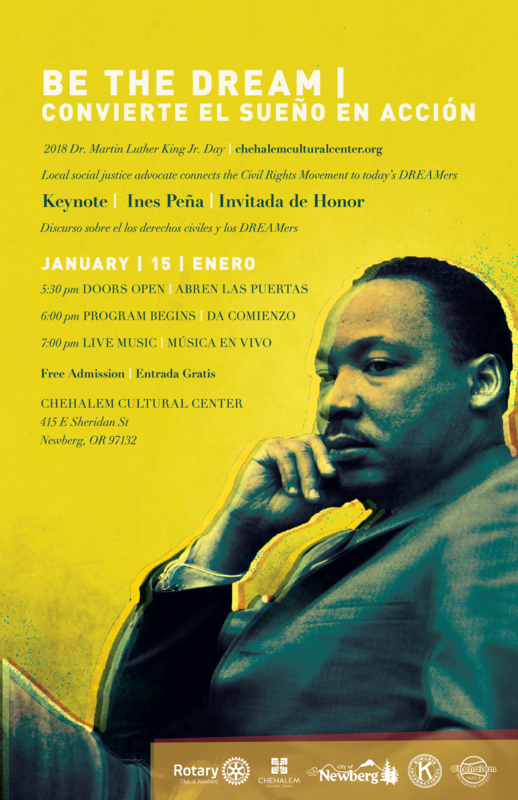 This coming Monday, Jan. 15th, will be Newberg’s 7th annual celebration of Dr. Martin Luther King, Jr. Day. This year also commemorates the 50th anniversary of his assassination. The theme for this year’s event is “Be The Dream,” and local social justice advocate and community organizer Ines Pena is the guest speaker. Ines is the first Latina to address the event. 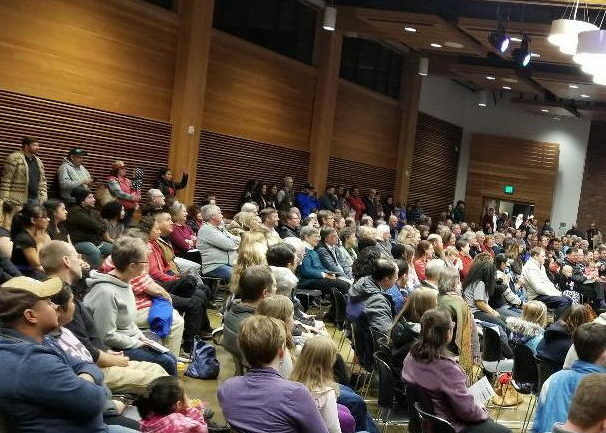 Doors open at 5:30pm at the Chehalem Cultural Center, with the program at 6pm. A Resource Fair and refreshments are scheduled at 7pm. 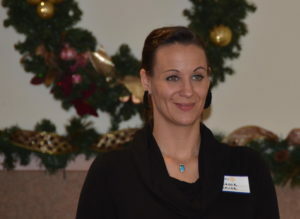 Shaina Farrer, communications manager with Love Inc., joined us to learn more about social media. She plans to return this week, too. Ashley Wirthlin Mumm, owner, Ashley Mumm Marketing LLC. Ashley will be our speaker on Wednesday. Spike, Judy and Dr. Stan dish up lunch for local seniors. 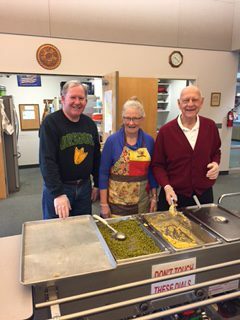 Spike Sumner, Judy Robinson and Dr. Stan Kern are among the club members who volunteer regularly at the Senior Center. They prep, serve lunches and clean up afterward. There’s still time to sign up to be on this committee. Many other committee options are available too. If you haven’t signed up yet, please see Paula Radich. 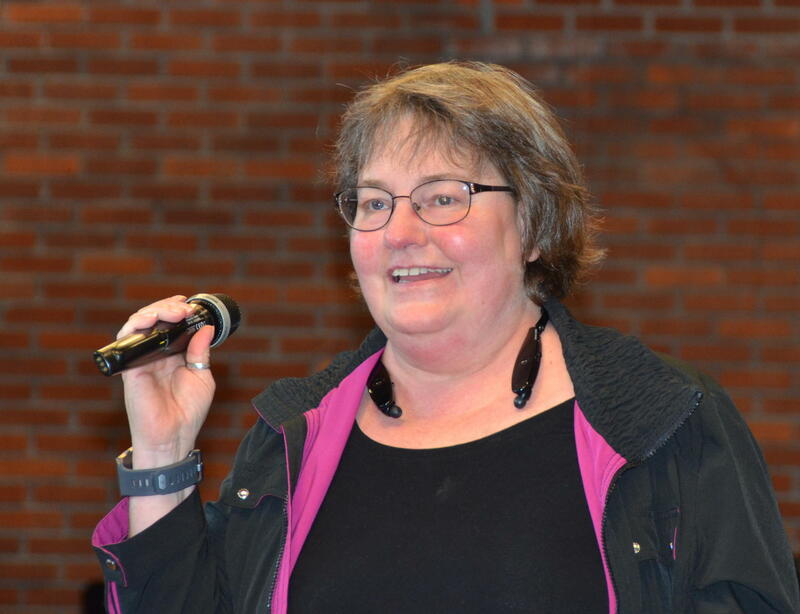 Auction Committee Chair Denise Bacon has donation forms available. If you need some, please see Denise. She also reported the auction committee meetings will move back to Adec in the evening to make them more convenient. Guatemala Dental Committee Chair Auggie Gonzales reminded us that this year’s mission is scheduled for the first week in March. If you are interested, please contact Auggie. Laura Tilrico, International Chair, reported that the second round of District matching grants is underway. A grant request for $1500 has been approved for the Mt. View Middle School Resource Room and one is in the works for $500 for a Rotary mural in Newberg. 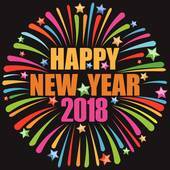 As far as programs go, our club will be starting the new year off with a bang. An informative, two-part series on “Effective Use of Social Media” featuring local marketing experts starts this Wednesday. Be sure to bring your phone. On Jan. 3, Brandon Porter will discuss how to use social media to grow your business, and the differences between social media platforms. While he’ll touch on other platforms, the emphasis will be on Facebook and how to use it more effectively. 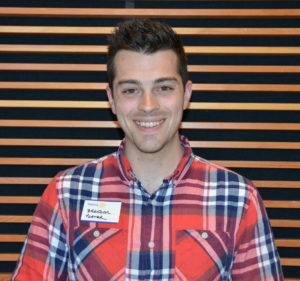 A bit of background on Brandon: He graduated from George Fox University in 2012 with a psychology degree. 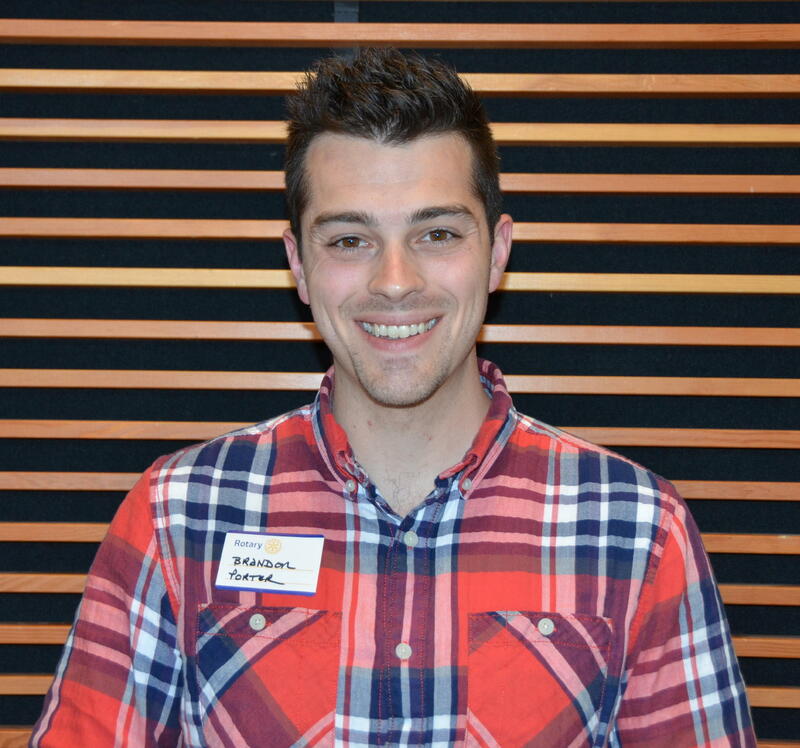 He’s a licensed real estate broker in the state of Oregon, focusing on growing his business in Newberg. 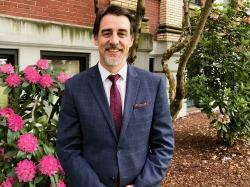 He and his wife Danika live in Newberg, where she serves the older adult population as Administrator over Friendsview Retirement Community’s in-home care program. They have an almost-2-year old daughter named Tilia. On Jan. 10, our speaker will be Ashley Mumm. In her presentation, Ashley will be touch on the importance of branding and marketing, and how they affect your appeal to your target market. Come prepared with questions and your laptop if you’d like to take notes. Both sessions will be open to the public, so please consider inviting a friend or co-worker. 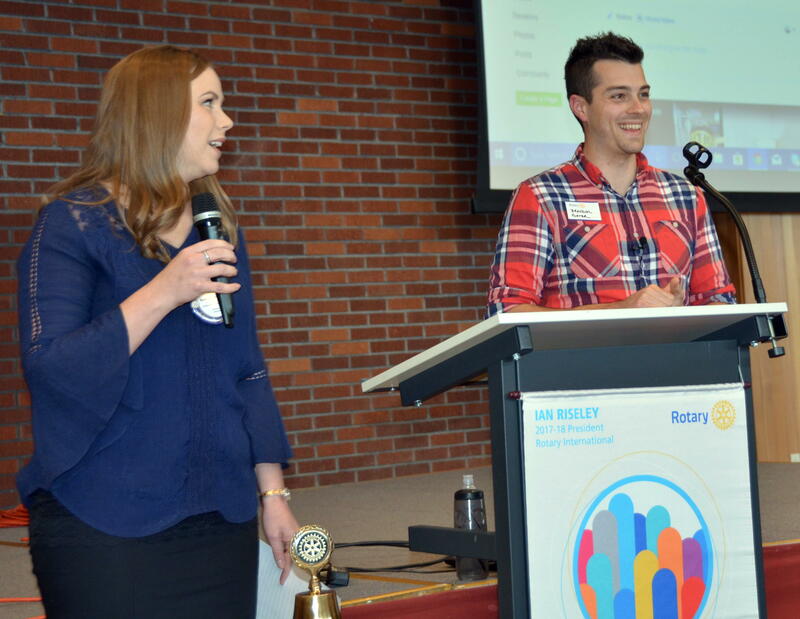 For our last meeting of the year, two representatives from United Way of the Mid-Willamette Valley updated us on the organization’s role, focus and activities. 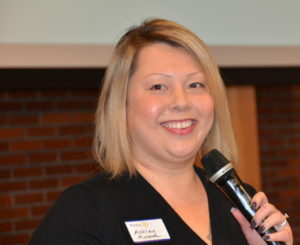 Elizabeth Schrader, director of resource development, and Cassie Cruze, development coordinator, explained that the organization serves Marion, Polk and Yamhill Counties. 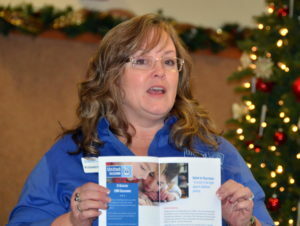 United Way has been city-centric in the past, but is now reaching out to rural areas. Cassie Cruze with United Way. To help small, local nonprofits, United Way provides grants for outcome-based programs and collaborative projects that address core needs. Over $65,000 was given to area organizations last year, including $10,000 to Yamhill 211. According to Cassie, United Way is working to increase awareness of this phone number as a resource for folks who need social services. In the area of emergent needs, United Way stands ready when a natural disaster such as an earthquake or other unanticipated crisis hits. “We work together with businesses, government agencies, schools, faith groups, individual community members and nonprofits. In that case, it takes the whole community to get the kind of results we need,” Cassie said. For more information, or to donate, go to unitedwaymwv.org. Time to Order Your Club Shirts! The actual cost of the shirts will be determined by the number ordered, but will be in the neighborhood of $13.95 for a regular tee; $18 for custom, and $34.95 for a regular polo; $38.95 for custom. Many thanks to Marge for offering to coordinate the orders. Orion Burnard, aka “Constellation Man,” attended to support Elizabeth and Cassie from United Way.